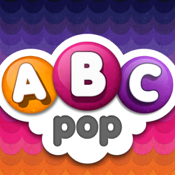 In Pop ABCs, your child will learn the alphabetic principle: to recognize letters and learn how letters are pronounced and sound. Once children are able to hear and discern sounds (phonemes), they are ready to associate those sounds with letters. With timeless 8-bit gameplay, wacky sound FX, points bonuses, colorful graphics and a clear learning objective, Pop ABCs is that rare thing: a game for all the family.